Originally I thought I wanted blue shoes for the big day, but now I'm thinking gold might be more fun. All totally out of my price range, but maybe just maybe I need a treat for myself. We'll see. Oh and I bought a new wedding dress this past weekend, I changed my mind about the first one. Oops. Defiantly treat yourself! Its your big day! And if you are a friend of Kate Spade on facebook, they are always offering a little something off! She just did a friends and family event 25% off, that always helps! I say treat yourself, it's your special day...and congrats on that, too! All of these are absolutely gorgeous.. and I need some too! 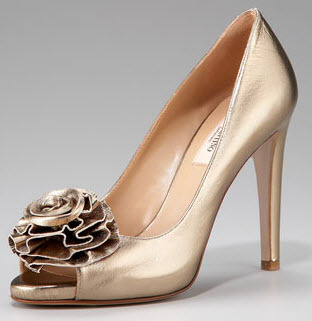 I have gold ones and LOVE them...go for it :) omg, a new dress? I need details STAT! OK, I so love that first shoe in raw silk. It is to die for for! I agree, go gold!!! So pretty. Love these shoes. 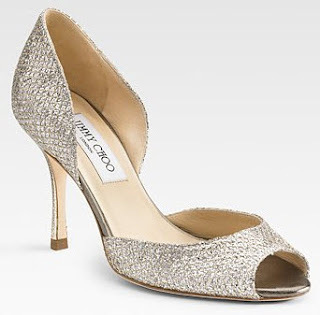 I just wore the Kate Spade silver glitter at my wedding, and they were so fun! Definitely treat yourself -- when will you have a better excuse? You only get married once, why not treat yourself. I love the idea of gold shoes on your wedding day. My sister wore gold Louboutins for her wedding last September and they looked so pretty and are way more useful than a white shoe...Now when she wears them out on the weekend she gets to think about her wedding...definitely worth treating yourself! The gold shoes are a must! Do it! I have those Jimmy Choos and LOVE them!!! But I would go for blue...I am pissed I didn't b/c thta was what I wanted..
Of course you need to treat yourself on your big day! I tried on so many shoes because I wanted them to be just right and comfortable. I ultimately ended up with Kate Spade. They really have a great selection. And I carried a satin navy Jcrew clutch...that was my something blue! These are so pretty; I love the variety of this hue...love it! If I could go back in time and wear one of these shoes on my wedding day I absolutely would! (can you imagine I wore white? eeew...) Its a brilliant idea...treat yourself! ohhhh, that would be so hard to chose! the pair in the third photo down makes me weak in the knees!! love the gold, but blue does sound pretty wonderful too! decisions, decisons! !